The Conservatives enjoyed a stunning election night, with David Cameron returning to Downing Street with an overall majority, an outcome that defied the pollsters and has significant implications for farming. David Cameron is heading back to Downing Street with an overall majority, after a stunning election night for the Conservatives. In an outcome that confounded all the polls heading into the election predicting a close race and some sort of coalition Government, Mr Cameron’s Conservatives made huge gains, winning enough seats to govern alone. By Friday lunch-time it was confirmed had reach the magic figure of 326 seats to secure and overall majority. The Conservatives are expected to get a 37 per cent share of the national vote, Labour 31 per cent, UKIP 13 per cent, the Liberal Democrats 8 per cent, the SNP 5 per cent, the Green Party 4 per cent and Plaid Cymru 1 per cent. Labour, and the Liberal Democrats, which was virtually wiped out after winning 56 seats in the last election, had dreadful nights, while the other big winner were the Scottish National Party, which virtually swept the board in Scotland, obliterating Labour in a former heartland. The Greens and UKIP did not make the gains they were hoping for. Labour leader Ed Miliband, Liberal Democrat leader Nick Clegg and UKIP leader Nigel Farage have all resigned. Labour’s night was compounded by the loss of Shadow Chancellor Ed Balls’ seat. Nobody had predicted an outright victory for the Conservatives, after virtually all the polls in the immediate run up to the vote had Labour and Conservatives neck and neck. In his victory speech after returning from Buckingham Palace, Mr Cameron said the Conservatives would ’govern as a party of one nation’ and promised to deliver devolution to Scotland, Wales and Northern Ireland. He said the Government, free from the compromise of coalition, would deliver all its manifesto pledges, including an in-out referendum on Europe. Among the seats won by the Conservatives was that of Farming Minister George Eustice, who massively increased his wafer thin majority of 2010, while Defra Secretary Liz Truss retained her Norfolk seat. But their former Defra colleague, Liberal Democrat, Dan Rogerson, lost his Cornwall seat, as did Andrew George, who campaigned for many years in Parliament to establish the Groceries Adjudicator, as the party lost all its seats in its former South West stronghold. High profile Liberal Democrat Cumbrian MP Tim Farron, a vocal campaigner for farmers, was one of the few Liberal Democrats to retain their seat and is now a strong contender to lead the party. Huw Irranca-Davies and Maria Eagle, part of the Shadow Defra team, won their seats. What does it mean for farming? A huge amount was riding on the outcome of this election as far as farming was concerned, with the main parties adopting fundamentally different stances on some key issues. Bovine TB: For many farmers, the most significant policy difference between the two main parties ahead of the election was on bovine TB, with the Conservatives pledging to push ahead with its 25-year TB Eradication Strategy, including badger culling in areas where disease is rife. The Conservative victory would appear to secure the continuation of the pilots culls in Somerset and Gloucestershire, which Labour had pledged to scrap, and the roll out of culling to new areas. In an interview with Farmers Guardian prior to the election, Mrs Truss pledged the Conservatives would roll out badger culling to new areas as part of the Government’s long-term TB eradication strategy, insisting the pilots showed culling to be ‘effective, humane and safe’. One immediate question, however, is whether there will be sufficient time to licence and prepare new areas to start later this year. It might also be significant that the Conservative will be governing alone, after Liberal Democrat MPs made much of their efforts to put a brake on Conservative plans for a badger during the last Parliament. Red tape: The Conservatives have also pledged to continue the drive to cut red tape on farms, including the establishment of a single body to co-ordinate farm inspections. Mrs Truss said the Farm Inspection Task Force would help ‘liberate farmers from red tape by coordinating all visits’. “Rather than having to deal with Natural England, the RPA, APHA and local authorities, farmers will be dealing with a single agency that would them and make us more efficient as we will avoid duplication,” she said. British food and farming: The Conservative manifesto promised a 25-year plan to ‘champion farmers and food producers’ and enable the industry to produce more British food, including the establishment of a Great British Food Unit to help trademark and promote local foods at home and abroad. Mrs Truss said farming was central to the Conservatives’ plans for economic and was seen as a ’major area for jobs and growth’. Europe and CAP: But it is on Europe that potentially the biggest implications will be seen for farmers. Mr Cameron has pledged to try and re-negotiate the UK’s relationship with Europe before holding a referendum in 2017 giving the UK public a say on the UK’s membership of the UK. While farmers might welcome any progress Mr Cameron could make on easing the regulatory burden from Europe, the prospect of a referendum raises profound questions for farmers, notably over the future of the Common Agricultural Policy and access to the single market. As part of the UK’s re-negotiation the UK would push for a reduction in red tape and a ‘more scientific approach’ to regulation on policy areas like GM and pesticides, with the UK having a greater say in these areas, Mrs Truss said. But she refused to speculate on the implications for farmers of leaving the EU. “I don’t want to leave. We want to stay in a reformed Europe,” she said. Mrs Truss said the Conservatives were keen to press for further simplification of the CAP and longer-term reform but stressed it did not want to disadvantage farmers in the process. Defra and its budget: There is the stark prospect of further cuts to the Defra budget, as a Conservative Government committed to further austerity to bring down the deficits commences its second term. While Mrs Truss said further savings could be made from increased efficiency within the Department, this will raise further questions about funding in keys areas like animal health and Defra’s ability to cope with emergencies like disease outbreaks. There will also be questions about how the Department will be structured under the new Conservative Government and whether it will remain in its current form. “I am making all my plans on the basis Defra will continue as is. I think it’s doable to make more savings from our budget,” Mrs Truss said. David Cameron is unlikely to wait for long to appoint his new Ministerial team. The industry will wait to see whether Liz Truss and George Eustice return in their current roles of Defra Secretary and Farming Minister. BPS: Aside from the big policy issues, an immediate priority for the new Defra team will be to ensure the Basic Payment Scheme is delivered as smoothly as possible, after all the recent problems. NFU vice president Guy Smith said it was vital sufficient resource was provided to enable the Rural Payments Agency to process the applications, mainly delivered by paper, to facilitate timely delivery of payments. NFU president Meurig Raymond said: “It looks as if there is going to be a stable Government and it will be important that we have a Secretary of State at Defra who will follow through their manifesto promises. “We want that person to champion British food and farming because it is no better way to grow the rural economy. I look forward to meeting the new Secretary of State and Ministers at the earliest opportunity." “The government must also ensure that focus is kept on fixing problems and issues surrounding BPS and its foot is kept on the pedal because with just weeks to go until the crucial June 15deadline, time is running out. CLA President Henry Robinson said his organisation would seek to ensure the new Conservative Government was clear about the implications for the rural economy of its policy on Europe that is likely to culminate in a referendum on EU membership in 2017. “Following five years in Government, we expect Ministers appointed with responsibility for rural affairs to demonstrate a strong understanding of the unique issues our members face. "We will be pressing for the party to keep the promises it made to the countryside and to rural businesses during the election campaign, such as a major business rates review, boosting British food exports, and cutting farm inspection red tape." “We have made good progress recently towards vital policy improvements such as reform of the compulsory purchase system and delivery of reliable and effective rural broadband. The Government must maintain momentum in these important policy areas." NFU Scotland president Allan Bowie said the election has signalled a significant shift in politics in Scotland and claimed their is ’unfinished business’ to resolve over Scotland’s share of the CAP budget. “With a majority Conservative vote, it will be important that the government is seen to listen and deliver on the needs of farmers in Scotland, and for MPs across the UK to come together and secure the best future for our industry. “There remains unfinished business on the issue of budget convergence. There had been strong commitment from two former Defra ministers to address this issue after the election to ensure budget imbalance to Scotland is readdressed, and Single Farm Payment rates have parity across the UK. “The discussion will now begin on when to have an EU referendum as set out in the party’s manifesto. Clearly the issue of European Union membership is of huge importance to farmers in Scotland. “Currently, the case is in favour of being part of the EU. Scottish farming currently receives millions of pounds in support from the EU each year via the CAP. Without this vital support, many Scottish farms would no longer be viable. In addition, the European export market is important for Scottish agriculture. If we were to exit the EU, Scottish producers would still have to comply with EU rules if we wanted to access these markets." Chris Mallon, chief executive of the National Beef Association welcomed the return to power of a party prepared to control badgers to tackle bovine TB (bTB). He said:“The Conservatives are the party that have brought in the cull to reduce the reservoir of TB in Wildlife. They have always been supporters of it, so let us hope that this continues. Roger Kerr, chief executive of organic certifier OF&G, said: "We sincerely hope ministers in the new Conservative government will work hard to ensure the needs and concerns of our licensees are met. "For the food and farming sectors as a whole we now expect the government to fulfil the pledges it made during the election campaign - such as cutting red tape and developing markets for British food and improving the natural environment, something which organic farming will help deliver. "For the organic sector in particular, it is vital that our producers are given proper support so that consumers continue to have a choice when food shopping in the UK. "To achieve this we will be pushing the government to think carefully about the implications of introducing GM crop technology into the UK to ensure adequate legal protection is given to British farmers who produce non-GM food." How did some of the key seats for farming turn out? 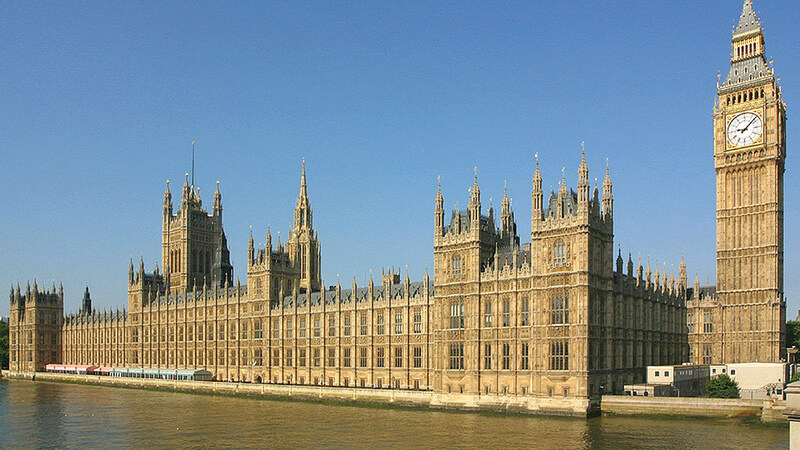 Among the prominent farming MPs who did not contest seats and have left Parliament are: Former Farming Minister Sir Jim Paice, veteran Liberal Democrat farm spokesman, member of EFRA committee and farmer Roger Williams and Anne McIntosh, chair of the EFRA committee in the last Parliament. There were a number of high profile defeats among party 'big beasts', including former Shadow Chancellor Ed Balls, Labour's leader in Scotland Jim Murphy, Shadow Foreign Secretary Douglas Alexander (Lab), Vince Cable, Liberal Democrat Business Secretary and fellow Liberal Democrat Shadow Ministers Ed Davey and Douglas Alexander, while Nigel Farage failed to won Thanet South for UKIP. Among those coming into Parliament was London Mayor Boris Johnson, who will no doubt feature prominently in the next Parliament. 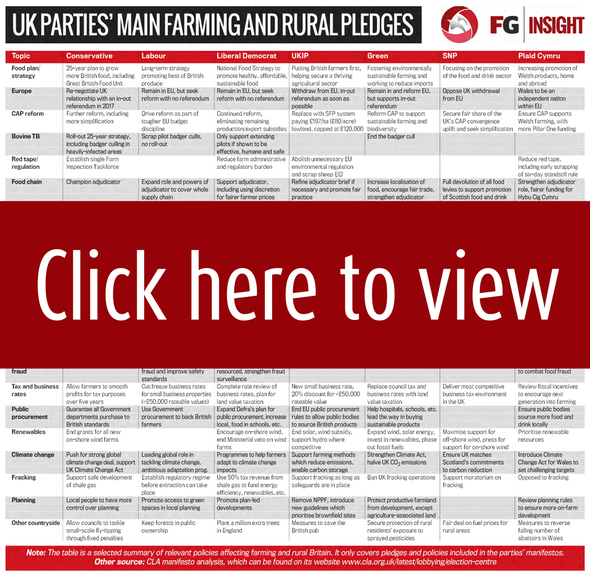 Before the election, we summarised where the main parties stand on the big issues affecting farming and the countryside.